Here is the list of the boutique* bicycle manufacturers, ordered by their name (starting with N, O, P, and Q). If you want to find a unique bike that fits your personality, review this list. 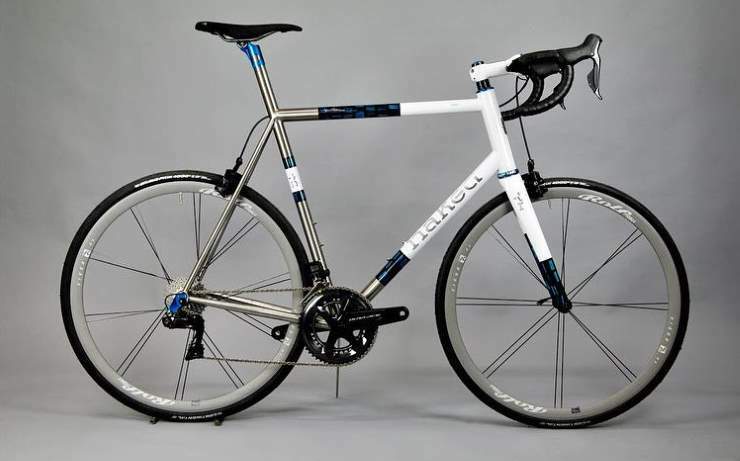 A Naked custom-built titanium road bike. Frame includes integrated seatmast, internal cable routing, Di2 ready, Enve 2.0 carbon fork. Custom in house DNA sequencing paint scheme. Buildkit includes Dura Ace Di2 groupo, Rolf Wheelset, G3 Power hub system, Enve Composites bars and stem (painted to match frame). Founded by Sam Whittingham in 1988, Naked Bicycles is a custom bicycle manufacturing company creating custom frames. The company is named after titanium, which has an atomic number of 22. It is located in Toronto, Ontario, Canada. The Officina Battaglin brand was founded in 2014 by Giovanni Battaglin, the Italian ex-rider who achieved the Giro-Vuelta double in 1981. After a 20-year break, he is now back to brazing steel frames, just like he used to do before aluminum and carbon became the de facto standard for bicycle production. Using the original process and craftsmen, Giovanni Battaglin is reviving his legacy, being the only Italian steelmaker to have significant experience riding steel in the pro peloton. The company is located in Viale Vicenza 4/1, Marostica, Italy. 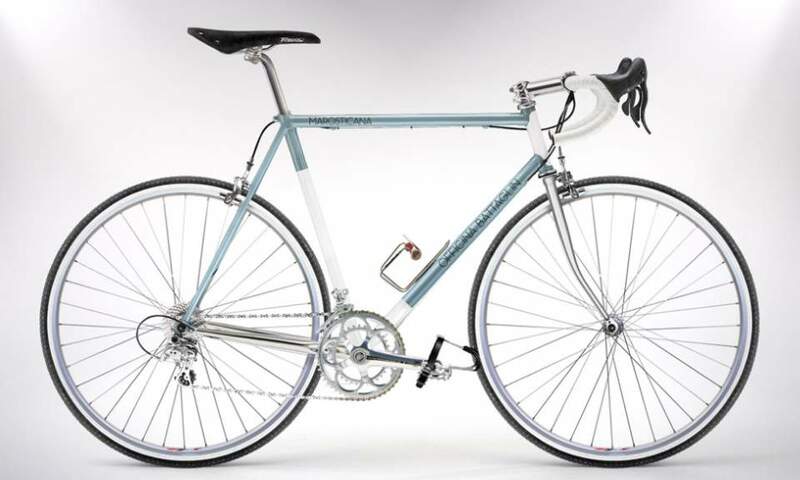 Marosticana is the classic Officina Battaglin steel frame which comes with a chrome-plated finish. It bears the name of the road that crosses the verdant plains at the base of the Venetian foothills and runs through the medieval town of Marostica, where the adventure of Giovanni Battaglin both as a professional rider and an entrepreneur began. Marosticana is a lugged frameset with a classic look, enhanced by the chrome-plated finish. It’s meant to be built either with vintage or modern components, so, it won’t be hard to be fully satisfied with the final result. Giovanni Battaglin (born 22 July 1951) is a former Italian professional road racing cyclist.He won both Giro d’Italia and Vuelta a España in 1981. This achievement is notable, because the Vuelta was running before Giro in those years, not in late August like today. The 1973 Giro d’Italia that began in Verviers in Belgium and was Battaglin’s debut in a grand tour. Battaglin immediately showed promise when he finished third on stage four ahead of Eddy Merckx and José Manuel Fuente. By halfway through the race, Battaglin was sitting in second place overall behind Merckx but lost that placing to Felice Gimondi. Still at the age of 21, the neo-pro astonished the cycling world by finishing third in the race. Battaglin would wear the maglia rosa for five days in the 1975 Giro d’Italia as well as several stage wins and wins in smaller stage races. He also won the King of the Mountains jersey in the 1979 Tour de France, even after he received a penalty for testing positive for doping. Battaglin finished third in the 1980 Giro d’Italia. The following year on the tenth stage mountain time trial of the 1981 Vuelta a España which was on the long climb to Sierra Nevada, Battaglin won the stage and took over the leader’s jersey. The only threat to Battaglin’s lead was Pedro Muñoz. Battaglin and his Inoxpran team withstood the challenge from the Spanish and brought Battaglin to his first grand tour victory. 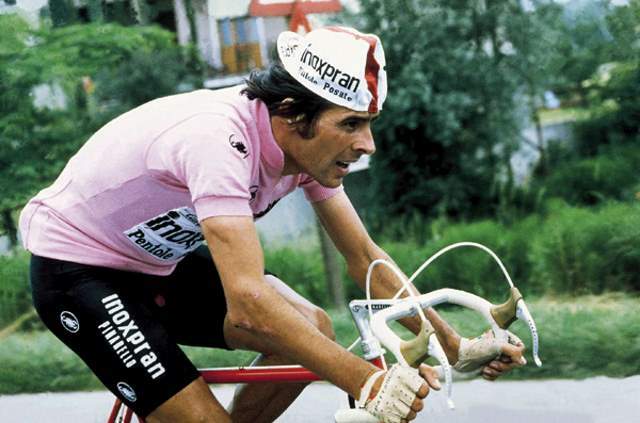 Three days later after Battalin’s triumph in Spain on 13 May 1981, he began the 1981 Giro d’Italia. On the 19th stage toward the end of the race, Battaglin won the stage to Mareo and took the maglia rosa from Silvano Contini. He withstood the final test – the final stage’s individual time trial to win the race in Verona ahead of Tommy Prim. Battaglin was only the second rider after Eddy Merckx to win the Vuelta-Giro double. In the space of one and a half months, Battaglin won two of the grand tours. Located in Lenexa, Kansas, United States, Pedalino Bicycles was founded by Julie Ann Pedalino. She started custom frame building after ten plus years working as a fine artist and graphic designer. She says her focus is on fit for all riders, but especially for the smaller riders who struggle to find a production frame that fits well. Pedalino Bicycles Sushumna Road Bike. 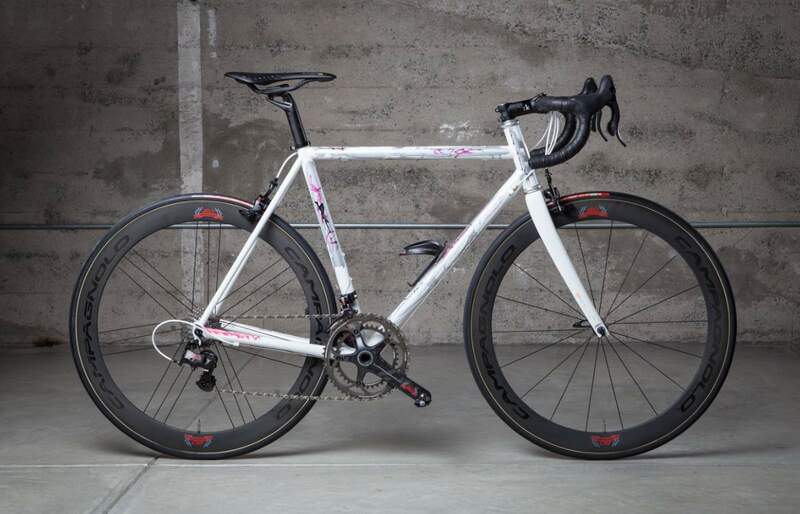 This bike was built to ride like the wind and for display at 2015 NAHBS. It won an honorable mention for the Best Campagnolo Equipped bike award! Featuring hand cut brass chakra ornaments and head tube badge. 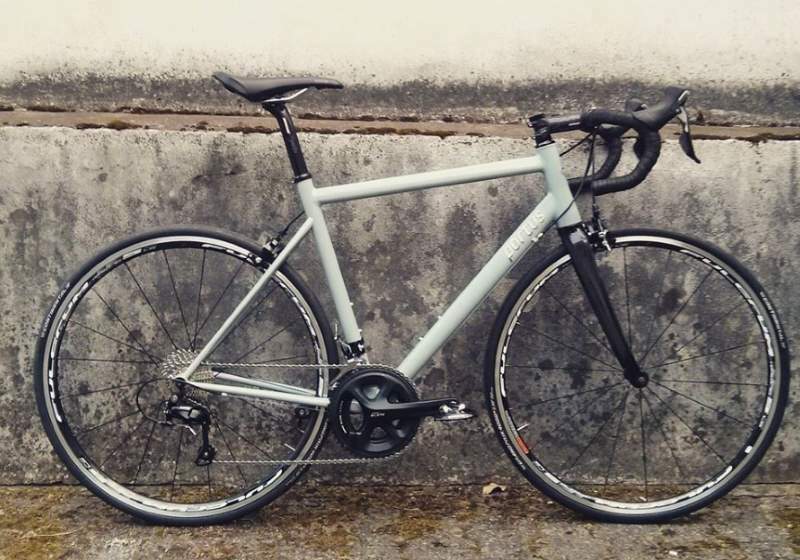 Build Details – Tube set: Henry James Bicycles True Temper OX Platinum. Campagnolo Athena 11 group set, Rolf Prima Vigor Alpha wheels, FSA SLK handlebars. The company is founded by Dario Pegoretti (January 18, 1956 – August 23, 2018), one of the most respected master framebuilders in the world. Pegoretti won the President’s Choice award at the 2007 North American Handmade Bicycle Show and framebuilder of the year at the 2008 show. After Dario’s passing in 2018, the “Bottega” continues to be inspired by his unique outlook on life, and today, the workshop remains a place for those who seek individual, honest products, built with precision, quality and timeless style. 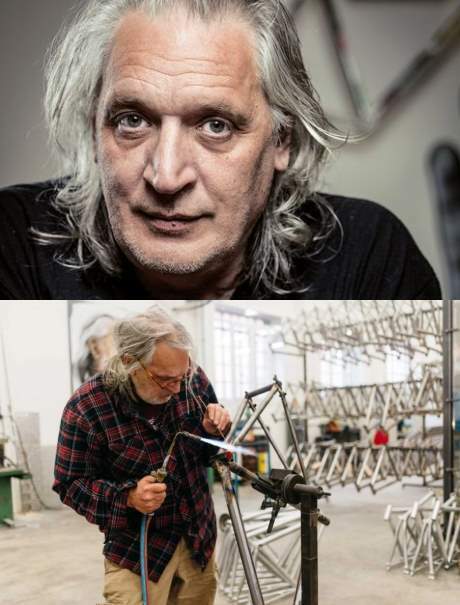 Dario Pegoretti (18 January 1956 – 23 August 2018) was an Italian bicycle framebuilder based for many years in Caldonazzo, outside the town of Trento, in the Dolomites, Italy, and then later for a few years in Verona, Italy. He was widely considered to be one of the great contemporary steel and aluminum bicycle framebuilders and a pioneer of lugless TIG welded frames. Peter Mooney Cycles is a part of Wheelworks, in Belmont, Massachusetts, United States. Peter has played a major role in developing Wheelworks into one of New England’s premiere bicycle retailers. He and like-minded partners opened the first Wheelworks store in 1977. He is still building bicycle frames, catering to a market that appreciates a hand-built, lugged or filet-brazed frame. Founded by Sante Pogliaghi, the company is based in Milan, Italy. Alcide Basso acquired the brand in 1993. Sante Pogliaghi saw in the young but already experienced frame maker his natural follower. He passed to Alcide his designs, his special made lugs and seals, the beautiful fork crowns and brake bridges. 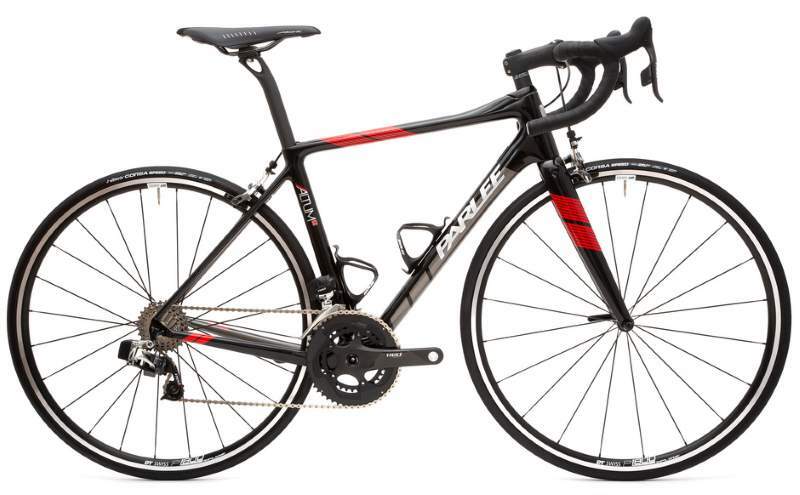 Those were the years of the development of carbon frames and just a few appreciated the characteristics of steel frames. This legacy has been preserved by Alcide Basso until today when at last many are rediscovering the noble material such as steel frames. 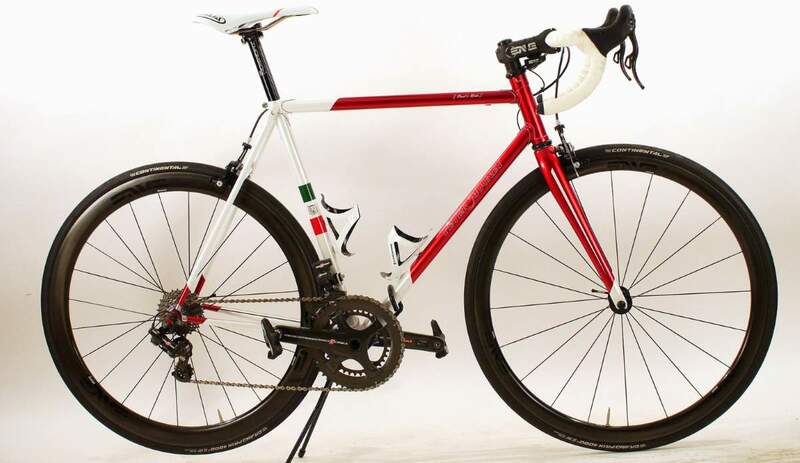 The idea of Alcide Basso is to maintain the same philosophy of Sante Pogliaghi: to propose not only custom bikes but to offer bikes which are “sewn on”. The German company was founded in 2014 and located in Pforzheim. They build custom handmade steel bicycles. Quiring Cycles was founded in 1999 by Scott Quiring, who is an avid cyclist since 1987. He started racing in 1989. In around 1992, he got his first exposure to framebuilding from a company called Greendale Bicycle Co., which was local to his area, and they produced Quiring a custom race bike. He quickly discovered that the custom bike in every way outperformed his previous off-the-shelf bikes. The 1996/1997 season was a big year for Quiring as he raced professionally on the Bianchi-Martini Racing Team, which was an international team that traveled around the States and the World to compete in National and World Cup events. When the team became defunct at the end of 1997, Quiring decided he needed to build a frame to his specs for racing and get back the feeling that his first custom provided. After many years of hard work that followed, Quiring Cycles, LLC, was finally formed in 1999 in order to make high-quality bicycles. 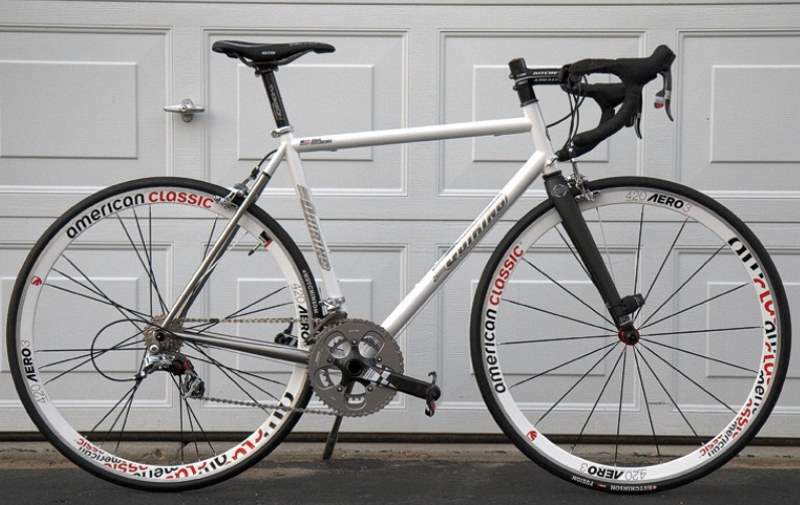 Quiring stainless steel road bike. Stainless basically has the same Modulus of Elasticity as steel. 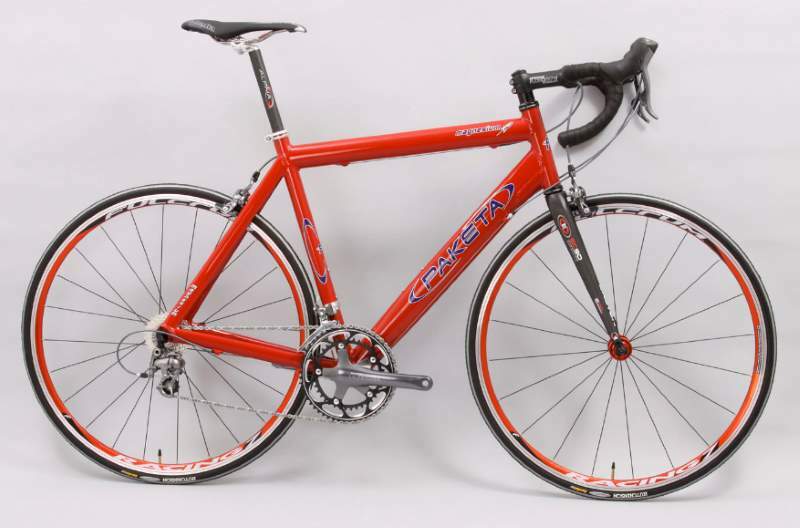 Therefore, it has a very similar feel to legendary steel frames. The stainless is rust resistant so it requires less concern for corrosion. This in turn means the metal of the frame can be left raw to save weight. 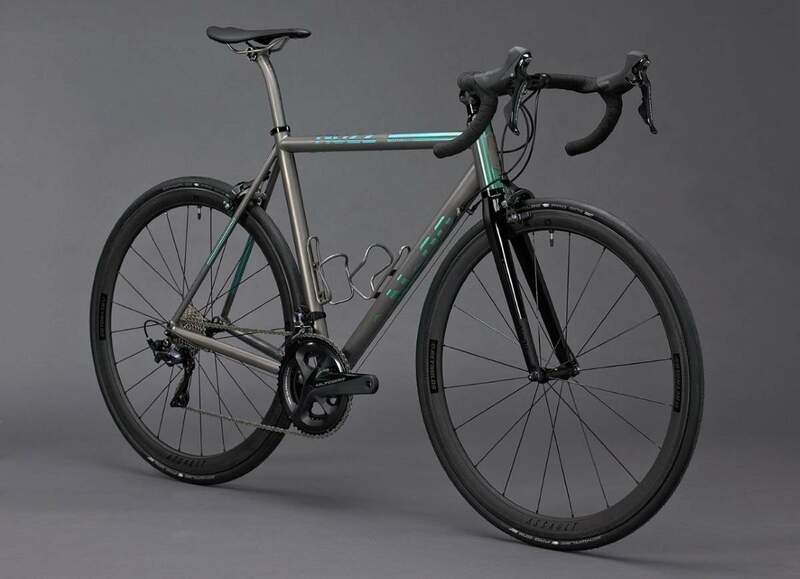 Thus, one can expect the weight of a stainless frame to be closer to that of titanium, but the liveliness closer to that of a high-quality steel frame. Stainless tubing used in Quiring custom frames is drawn into very thin butted walls to save weight. Based on data provided by the tubing manufacturers, what it lacks in wall thickness is made up by an amazing tensile strength. This stainless steel base metal has a breaking strength of an incredible 200,000 psi or more. Or, in other words, it is 500% more than the tensile strength of typical aluminum alloys, and a little more than 60% stronger in tensile strength when compared with 3/2.5 titanium in a cold-worked-stress-relieved state.